•The basic Central Station Data section (see example in the illustration below) is filled in first. ✓Retrieve (F2 Search) the appropriate Subscriber record. •The Central Station Data section will be displayed. a.The Central Station Data information entered for the Subscriber may have any number of Subscriber Panels (and their related CSIDs) identified for that same Subscriber. b.You cannot remove the Central Station Data information, or delete the Subscriber record if there are Subscriber Panels defined for the Subscriber. c.However, the Subscriber may be taken Off Line, if necessary. d.See the Deleting a Subscriber chapter for additional information. ✓Date Online - By default, the Date offered is Today. ▪Use the Drop-Down Calendar/Date Entry field to reset that Date, if needed. ✓Town Code - This code represents an abbreviation for a Municipality (or similar governmental entity) that provides Emergency Response Services when requested by an Operator (while Processing an Alarm Signal) during a Dispatch procedure. ▪Using the Drop-Down Selection List, Choose the appropriate Town Code (responding authority) for this Subscriber. ▪Click the Ellipse to Add/Update existing Town Code records. ✓Security Company - If this Subscriber has contracted for Response from an outside Security Company, use the Drop-Down Selection List to Choose that Security Company. ▪Using the Drop-Down Selection List, Choose the appropriate Security Company (special responding authority) for this Subscriber. ▪Click the Ellipse to Add/Update existing Security Company records. ▪Note: If the installation will be issued a UL® Alarm Certificate, also identify the UL Classification and enter the required Response Time (see "Other Special Settings" below). ✓Dealer - If this Account is being monitored by your Company's Central Station for another Alarm Dealer, use the Drop-Down Selection List to Choose that Dealer Name. ▪Click the Ellipse to Add/Update existing Dealer records. ✓Sub Dealer - This field may be populated by the system when required for the MKS Dealer Billing module. ✓Account Type - Each monitored Subscriber must be assigned an Account Type - which is a general classification of the type of monitored account this will be. ▪Using the Drop-Down Selection List provided, Choose the appropriate Account Type for this Subscriber. ▪Click the Ellipse to Add/Update existing Account Type records. ➢Note: Many governmental entities which provide Response Services to Alarm Signalss require that each Alarm System installed within their jurisdiction has a Permit (and enforces this requirement by asking for that Permit Number prior to accepting an Operator's Dispatch request for that Subscriber). a)The Town Codes Form contains a Police Department Permit and Fire Department Permit Check box that corresponds to the PD Permit # and FD Permit # fields below. b)If a PD Permit and/or an FD Permit box is Checked in the Town Codes Form, those Subscribers assigned to that Town Code must have the corresponding Permit Number(s) entered - as described below. ✓PD Permit # - If the Operator is required by this Emergency Response Service to provide a Police Department Permit Number before a Dispatch request will be accepted, the required Permit Number must be entered in this PD Permit # field (see the Town Codes chapter for more information). ✓FD Permit # - If the Operator is required by this Emergency Response Service to provide a Fire Department Permit Number before a Dispatch request will be accepted, the required Permit Number must be entered in the FD Permit # field (see the Town Codes chapter for more information). ➢Note: The term "Password" and "Passcode" may be considered interchangeable terms throughout these Help Files. ✓Passcode - For identification purposes, enter the Password that the Subscriber will use to Verify their identity. ▪The Password entered may be up to 25 characters in length and contain numbers and letters. ▪Keep in mind that a Password will be communicated verbally and so should be entered as it would be "heard" by an Operator. ✓Duress - For identification purposes, enter a Duress code to be used by the Subscriber to indicate that this Subscriber (customer, employee, agent, etc.) is unable to verbally request the need for help because that person is communicating with an Operator while under duress. ▪The Duress code entered may be up to 25 characters in length and contain numbers and letters. ▪Keep in mind that a Duress code will be communicated verbally and so should be entered as it would be "heard" by an Operator. ▪None - No Opening and/or Closing Events are Supervised. ▪Both - All Opening and Closing Events are Supervised. ▪Open - Only Opening Events are Supervised. ▪Close - Only Closing Events are Supervised. b)An Invalid Alarm signal will be generated (by SPA) with either an IO* or IC* Alarm Condition Code. ✓Alarm Group - Use the Drop-Down Selection List to Choose their Alarm Group assignment. 3.Speaks the language that the person to which she/he is currently responding will also be speaking. ▪Click the Ellipse to Add/Update existing Alarm Group records. ➢Important Note! : It is very, very important (critical) to keep in mind that a Subscriber assigned to an Alarm (Processing) Group will not have their Active Signals processed unless at least one Operator - which has been assigned to that Alarm Group - is actively Processing Signals! a)Until a specific requirement dictates otherwise, initially assign all Subscribers (in this Central Station Data Form) to the "Default" Alarm Group. b)At a minimum, also assign all Employees, whose Employee Type is either All or Operator, to the same "Default" Alarm Group on the Alarm Groups tab of the Employee Form. c)Any number of additional Alarm Group may then be assigned to each Operator, as the need arises, and the appropriate training has been completed. ✓Date Offline - If this Account is ever canceled, Click the Date Off Line button (see the mouse pointer in the illustration below). ▪Caution! This action takes All CSIDs defined in the Subscriber Panels section Off Line. ▪See the Central Station Off-Line Date chapter for detailed information. ✓UL Classification - If the installation will be issued a UL® Alarm Certificate, use the Drop-Down Selection List provided to Choose the UL Classification category of the system. 6.UL® residential burglar alarm systems, and account number. 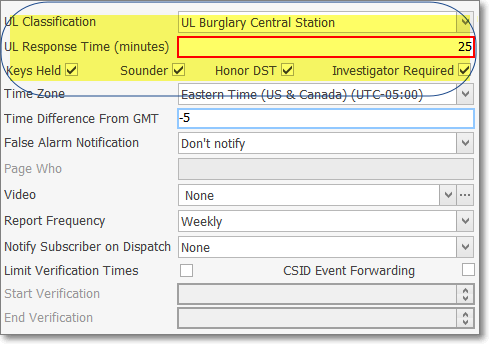 ✓UL Response Time (minutes) - If a UL Classification has been identified, enter the required Response Time (in the number of Minutes). ✓Keys Held - Check this box if your Company has a set of keys to the Subscriber's premises. ✓Sounder - Check this box if there is a audible alarm at the premises. 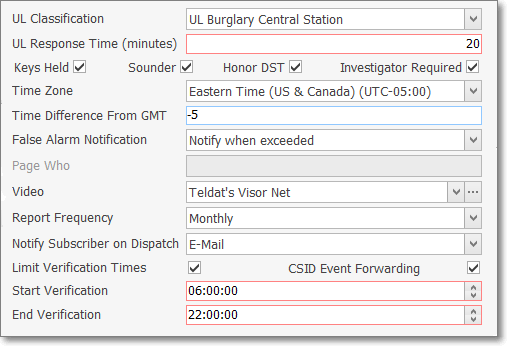 ✓Honor DST - Check this box if this Subscriber's location honors Daylight Savings Time. ✓Investigator Required - Check this box when an Investigator is required to be dispatched, and to respond to certain Alarm Signals. ➢Note: If the installation will be issued a UL® Alarm Certificate, see the UL Settings, Signal Processing & Reporting Procedures chapter for additional information! ✓Time Zone - Use the Drop-Down Selection List provided to Choose the Subscribers Time Zone. ✓Time Difference From GMT - The system will insert the time difference - in the number of hours - between Greenwich Mean Time and the Subscriber's local time zone (e.g., Eastern Time in US is five hours behind [-5] Greenwich Mean Time and Pacific Time is eight hours behind [-8] Greenwich Mean Time). ▪Notify When Exceeded - Choose this option to Notify the Operator when the Maximum number of allowable False Alarms has been exceeded. a)Define the False Alarm Tracking requirements for each Responding Governmental Authority (using the Town Codes Form). b)Identify each Subscriber who needs False Alarm Tracking using the False Alarm Account Maintenance Form. 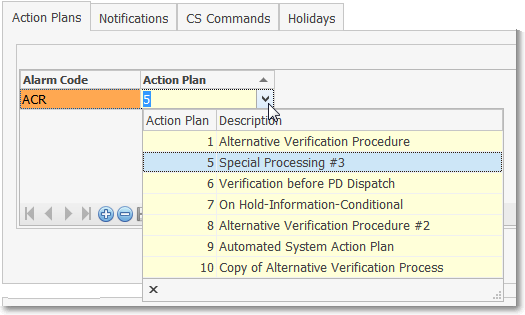 c)Review Alarm Signals to determine whether they were False or Valid using the False Alarm Dispatch Tracking dialog. ▪Don't Notify - Choose this option to ignore any False Alarm Tracking reporting requirements relating to False Alarms from this Subscriber. 1.The False Alarm Account Maintenance Form for designating which Subscribers are to be specifically tracked for False Alarms. 2.The False Alarm Dispatch Tracking dialog provides the means to manage, update and comment on the Alarm Signal records that were initially classified as False Alarms. 3.The Town Codes Form can also identify those municipalities that track the number of False Alarms created by each Premises. ✓Page Who - This field has been deactivated. ✓Video - Using the Drop-Down Selection List provided, Choose the appropriate Video Verification option if it is in use. ▪Click the Ellipse to Add/Update existing Generic Video Setup records. 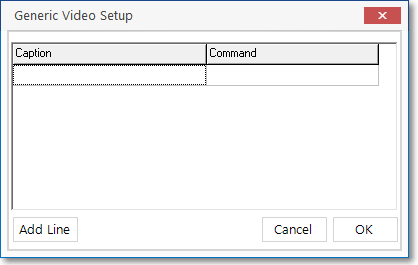 ▪See the "Video Setup dialogs" information at the end of this chapter. ✓Report Frequency - If Opening and Closing activity will be supervised, use the Drop-Down Selection List to Choose how often the Subscriber should receive an Open and Close Report. ✓Notify Subscriber on Alarm Dispatch - For those using the Communication Module, you may automatically notify the Subscriber whenever a Dispatch is required for an Alarm Signal received from their premises. ▪Use the Drop-Down Selection List at the top right of the Central Station Data Form to Choose the method of notification. ▪By default, None is the entry. ✓Limit Verification Times - If the Subscriber only wants their Alarm Signals Verified within a specific time frame, Check this box. ▪Start Verification - By default, 09:00. Reset the starting time as needed. ▪End Verification - By default, 18:00. Reset the ending time as needed. ✓CSID Event Forwarding - The purpose of assigning a Master CSID to a Subscriber Panel's CSID is to avoid having to enter more than one set of CSID Zones, People To Call (and optionally Events - see immediately below). ▪However, Events and Tests are only forwarded to the Master CSID when the CSID Event Forwarding box is Checked on this Central Station Data section, and the UseCEF option is set to True ("T") in Company Settings Grid. ✓Last Update By - This system maintained field displays the Log In Name of the User who made the most recent modification to this record. ✓Last Update Date - This system maintained field displays the Date and Time when the most recent modification was made to this record. ✓Cross Street - Enter the closest Cross street to the Subscriber's premises. ✓Central Notes - This populates the Comments field on the Sub Info (F2) Form and is displayed for the Operator as an Alarm Signal is being Processed. ✓Test Notes - This is a Note or Comment - which is entered in the Central Station Data Form of a Subscriber (and/or on the Dealer Form associated with that Subscriber) - that will always be presented to an Operator when any CSID defined in the Subscriber Panels section of their Central Station Data Form is Placed on Test. 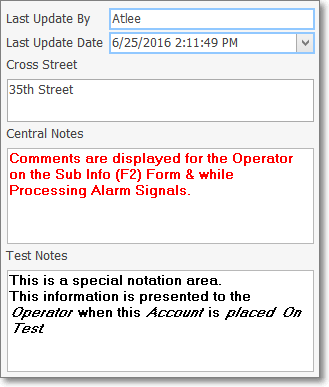 ▪Enter the Note that should be displayed for the Operator whenever this Account is Placed on Test. 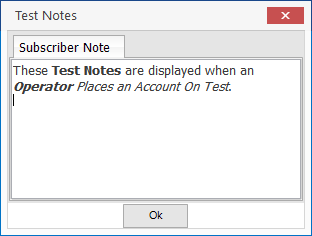 ▪Subscriber Note tab - When an Operator Places an Account on Test, this Test Notes entry will be displayed in the Subscriber Note tab of the Test Notes dialog, and when viewing this Subscriber record on the Sub Info (F2) Form. 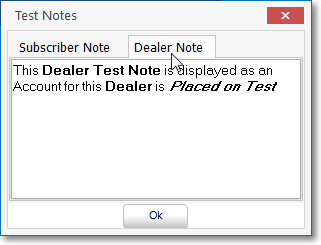 ▪Dealer Note tab - For those Accounts that are being monitored for an Alarm Dealer, the associated Dealer's Test Notes entry (created in the Dealer record) is also accessible in the Dealer Note tab within the Test Notes dialog. ❖Also see the Service Info Section chapter to learn about the Directions field - used to assist the Operator with the dispatching process, and the Comments Section chapter to learn about another Comments field, and using the Rich Text Editor. ❑The Subscriber Panels section on the Monitoring tab allows you to define each Control Panel's CSID which has been installed at the premises of the currently selected Subscriber. •Panel Information - Define each CSID programmed to report from this Subscriber's Premises. •Account Testing - Define the Account Testing information for the selected Subscriber Panel CSID thereby establishing what constitutes a valid Test Signal for this Account. •Alternate Call List - Assign an Alternate People To Call List which is entered as a CSID in the Alt.Call List field which then attaches that Alternate CSID's People To Call list to this Subscriber Panel's CSID record. •Alt Events - Identify another Account's CSID which contains Events to be used with this Subscriber Panel's CSID record. •Areas - Define each Area within a Subscriber's Premises that needs to be monitored individually, Armed and Disarmed individually, and have Opening, Closing, and other types of Test Events Supervised individually. •Conditions Call List - Identify an Alarm Condition Code (and optionally a Signal ID and/or Physical Zone) which, when assigned to an Alarm Signal received from a specified Subscriber Panel(s) CSID, will utilize a customized People To Call List and Calling Order specifically defined for that purpose (in a special CSID Zones record). •CSID Zones - Define the Exceptions to the default Panel Zones of the Communicator Format assigned to the currently selected CSID. •Dealer Call List - Assign the appropriate Dealer's People To Call List which is entered as a CSID in the Alt.Call List field which then attaches that Alternate CSID's People To Call list to this Subscriber Panel's CSID record. •Documents - Associate and/or attach specific Documents to this Subscriber Panel's CSID record. •Events - Define the supervised Events that are to be monitored for this Subscriber Panel's CSID record. •Floor Plan - Attach a Floor Plan image to this Subscriber Panel's CSID record. 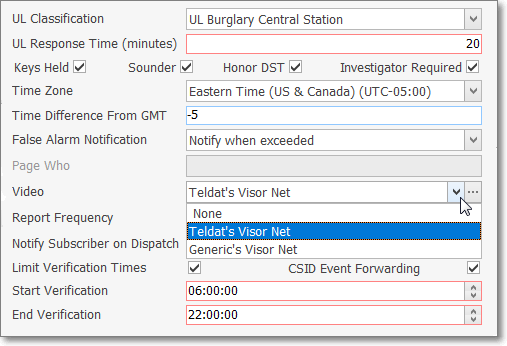 •History - Look up Alarm Signal History for this Subscriber Panel's CSID record. 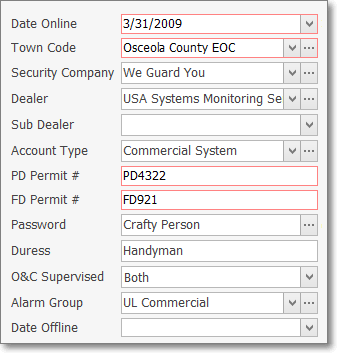 •Loss Prevention - Define and/or update a Loss Prevention tracking record for this Subscriber Panel's CSID record. •People To Call - Enter the People To Call information for this Subscriber Panel's CSID record. •Temp Notes - View the active Temporary Notes for this Subscriber Panel's CSID record. •Unverified Zones - Lookup and/or reset the Unverified Zones information for this Subscriber Panel's CSID record. ❖See the Subscriber Panels - Panels Info chapter for complete information about this Subscriber Panels section on the Monitoring tab. •The Action Plans sub-tab - The Action Plans sub-tab located below the Subscriber Panels section on the Monitoring tab provides the ability to identify a specific Alarm Condition Code and an associated Action Plan which, when received at the Central Station, will not be processed by the Operator, but instead will be processed in the background (using the Action Steps defined in that designated Action Plan ) by the Micro Key Solutions Automated System Action Plans Service ("MKSASP") application. •The CS Commands sub-tab located below the Subscriber Panels section on the Monitoring tab provides the ability to define specific Commands for an Operator to display a Web Site or open an Application for their use while Processing an Alarm Signal for this Subscriber. •The Holidays sub-tab located below the Subscriber Panels section on the Monitoring tab provides the ability to define which of the predefined set of Holidays are celebrated by the currently selected Subscriber. 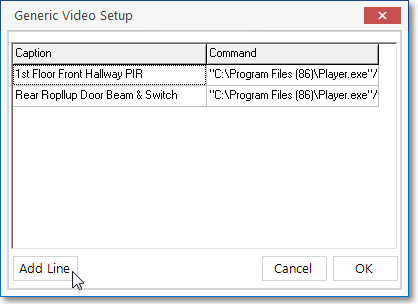 ❑Video Setup dialogs - If you are using Video to validate an alarm, use the Drop-Down Selection List to Choose the system being used. •Video - Using the Drop-Down Selection List provided, Choose the appropriate Video Verification option, if it is in use. ✓Click the Ellipse to Add new and/or Update existing Generic Video Setup records. ✓Configuration - If you are using Video to assist in validating an alarm, Click the Configuration button and enter the required information. ✓Caption - Enter a brief description of this point of protection. ▪When this signal is received, a message will be sent to the Operator, with this description, alerting them that there is a Video feed attached. ✓Command - Enter the command line call that will be used by the MKMSCS module to run the selected Video application when this signal is received. ▪Ex. "C:\program files\Video Player Folder\YourPlayer.exe"
✓Click OK to record all of the Video Setup information. 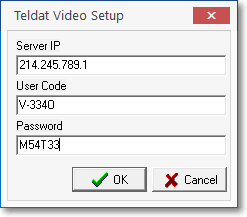 ✓Click the Ellipse to Add new and/or Update existing Teldat Video Setup records.